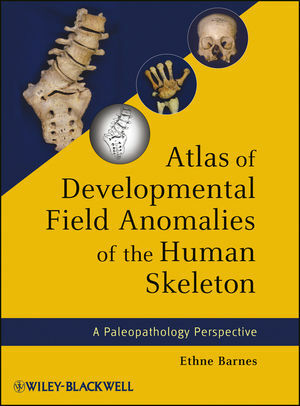 Written by one of the most consulted authorities on the subject, Atlas of Developmental Field Anomalies of the Human Skeleton is the pre-eminent resource for developmental defects of the skeleton. This guide focuses on localized bone structures utilizing the morphogenetic approach that addresses the origins of variability within specific developmental fields during embryonic development. Drawings and photographs make up most of the text, forming a picture atlas with descriptive text for each group of illustrations. Each section and subdivision is accompanied by brief discussions and drawings of morphogenetic development. Ethne Barnes is well known for her 1994 book, Developmental Defects of the Axial Skeleton, still widely in use today. A recognized specialist in the area of skeletal defects, Dr. Barnes is probably the premier expert in congenital defects of the central part of the skeleton. Currently she works as Physical Anthropologist / Paleoanthropologist for Corinth Excavations, ASCS in Tucson Arizona.